A year-long initiative in Emory College of Arts and Sciences to recruit a cohort of faculty in the natural and social sciences has resulted in a cluster hire of five new faculty, including Gillian Hue (left), lecturer, neuroscience and behavioral biology (NBB); Juan Villeta-Garcia, lecturer, mathematics and computer science; Dorian Arnold, associate professor of computer science; John Lindo, assistant professor of anthropology; and Nicole Vega (not pictured), assistant professor of biology, who will join Emory in spring 2018. 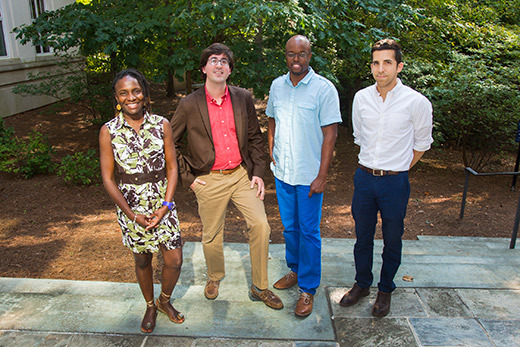 A year-long initiative in Emory College of Arts and Sciences to recruit a cohort of faculty in the natural and social sciences has resulted in a cluster hire of five new faculty for 2017-2018 who are expected to have broad impact on the teaching and research missions of the College. The cross-departmental effort sought to recruit faculty who not only had exceptional research and teaching portfolios, but also a proven track record of mentoring a diverse student body, including first-generation and underrepresented minority students. Nicole Vega, assistant professor of biology, who will join Emory in spring 2018. As a bonus to the intensive recruitment effort, other candidates for positions outside of the cluster hire were identified, including Antonio Braithwaite, a senior lecturer in chemistry, and associate professor Jennifer Heemstra, also in chemistry. For members of the cluster hire, joining the Emory College faculty means increased opportunity to expand their current research and student mentorship. The two new faculty in the Department of Mathematics and Computer Science, for instance, are scholars in very different fields but are expected to foster more interdisciplinary research between mathematics and computer science, and beyond. Arnold studies the theory, design and development of software systems and other tools that run high-performance computing systems. Villeta-Garcia focuses on algebraic topology, or the qualitative features of spatial objects. Their work is steeped in other fields, such as physics. And their work also involves efforts to elevate their fields across campus and beyond Emory. Villeta-Garcia wants to recreate a weekend mentorship program he helped run at the University of Illinois —– designed specifically for women and students of color — at an Atlanta-area high school. Arnold hopes to create a pipeline of students to study at Emory and go on to PhDs in the field. In addition to his scholarship, that means continuing activities such as his recent three-year appointment as a Distinguished Speaker for the Computer Research Association, and leadership in the Tapia Celebration of Diversity in Computing, which will bring more than 1,000 students and professionals to Atlanta this fall. Emory College engaged faculty and chairs in eight programs — anthropology, biology, chemistry, environmental sciences, NBB, math/computer science, physics and psychology — to develop the ambitious recruitment effort for the cluster hires, says Carla Freeman, senior associate dean of faculty for Emory College. All of the new faculty are therefore tied to the existing programs and the goals for the future. For instance, Lindo focuses on biological anthropology, looking at ancient DNA to examine the evolution and migration of early humans. Specifically, his work explores how Incas and Mayans developed genetic advantages for digesting starches after creating some of the first cities that allowed for farming. Being at Emory means continuing his research and teaching highly motivated undergraduates who want to understand science in a different way. Lindo also plans to create two undergraduate research positions for students with Hispanic and Native American backgrounds, who will be intellectually curious to work on the DNA of their own ancestry. “The opportunity for discovery, in my research and with my students, is a big part of why I wanted to come to Emory,” Lindo says. Freeman sees opportunities for Emory as well. One of questions posed to the top scientists who applied — asking about their mentorship track records and vision — will now be incorporated into the search process for all future faculty positions in the College of Arts and Sciences.